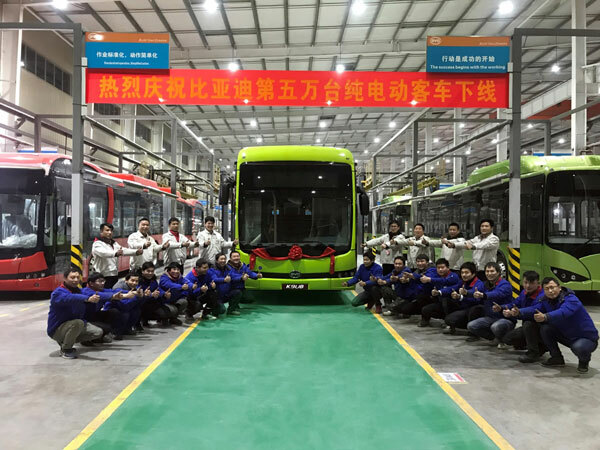 On January 18, new energy technology company BYD proudly announced the production of its 50,000th pure electric bus, nine years since production began. The milestone follows the departure of a K9UB 12-meter pure electric bus for Spain from BYD’s Hangzhou testing facility. BYD boasts the world’s largest selection of battery electric buses, and a clientele that spans across 300 cities around the world. The K9UB pure electric bus that was exported to Spain features an all-new styling, with a capacity of 80 passengers. As Spain’s largest 12-meter pure electric bus, this bus will be operated by local operator TUBASA and is expected to enter service in Badajoz, a city in southwestern Spain this spring. BYD entered Spain’s electric bus sector in 2017, and currently has orders from various cities such as Valencia, Saint Cugat, Badalona and Badajoz. To date, BYD is the only Chinese company to enter the Spanish electric bus market successfully. Ever since the first K9 pure electric bus was produced in Changsha in 2010, BYD has actively advocated for the adoption of new energy vehicles. In 2010, in order to ease environmental pollution, BYD proposed its “Public Transportation Electrification” strategy. With Shenzhen’s hosting of the 26th Summer Universiade in 2011 came a turning point, as 200 BYD K9 pure electric buses entered operations in the city. That event saw BYD become the world’s first company to commercialize new energy buses. Today, BYD pure electric buses have not only become commonplace in major Chinese cities like Beijing, Guangzhou, Shenzhen, Tianjin, Hangzhou, Nanjing, Changsha and Xian, but also spread to other medium- to small-sized cities in the country. In addition, BYD has also gradually grown its international customer base for pure electric buses since the first batch of 35 electric buses was exported to Amsterdam Schiphol airport in 2013. These include Transport for London, Los Angeles Public Transport Co., Sydney Airport, Stanford University and Facebook. BYD Company Ltd. is one of China’s largest privately owned enterprises. Since its inception in 1995, the company quickly developed solid expertise in rechargeable batteries and became a relentless advocate of sustainable development, successfully expanding its renewable energy solutions globally with operations in over 50 countries and regions. Its creation of a Zero Emissions Energy Ecosystem – comprising affordable solar power generation, reliable energy storage and cutting-edge electrified transportation – has made it an industry leader in the energy and transportation sectors. BYD is listed on the Hong Kong and Shenzhen Stock Exchanges. More information on the company can be found at http://www.byd.com.